I figured today would be a good day to post this, with David Rose’s article in the “Sunday Mail” Met Office proof that global warming is still ‘on pause’ as climate summit confirms global temperature has stopped rising. This post is available just in case someone wants to back David by linking this post once or twice in comments on that thread. It’s really tough to miss the pause in the time-series graphs, and the trend graphs sock the message home. 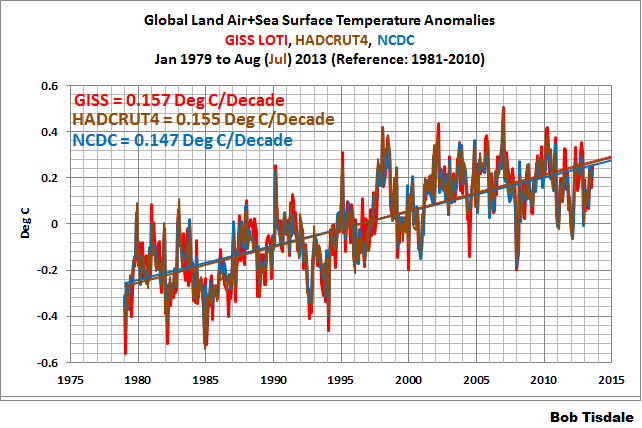 Initial Notes: This post contains graphs of running trends in global surface temperature anomalies for periods of 12+ and 16+ years using the NCDC Global (Land and Ocean) Surface Temperature data. They indicate that we have not seen a warming hiatus this long since the 1970s. Update: The August 2013 GISS global temperature anomaly is +0.62 deg C. It warmed (an increase of about 0.09 deg C) since July 2013. The NCDC data source is usually here. 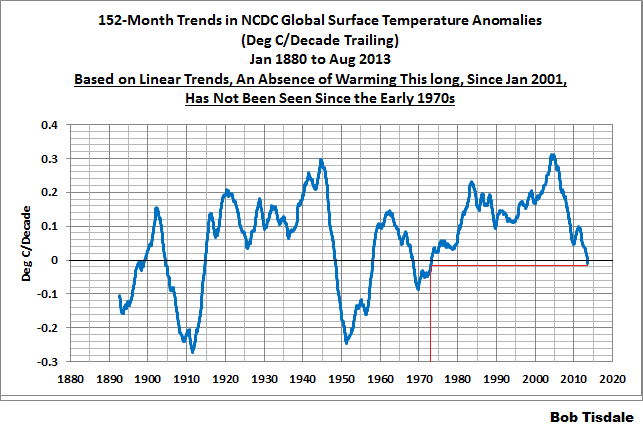 NCDC uses 1901 to 2000 for the base years for anomalies. Update: The August 2013 NCDC global land plus sea surface temperature anomaly is also +0.62 deg C. It increased 0.02 deg C since July 2013. Update (Lags One Month): The July 2013 HADCRUT4 global temperature anomaly is +0.51 deg C. It increased (about 0.06 deg C) since June 2013. The period from January 2001 to August 2013 is now 152-months long. 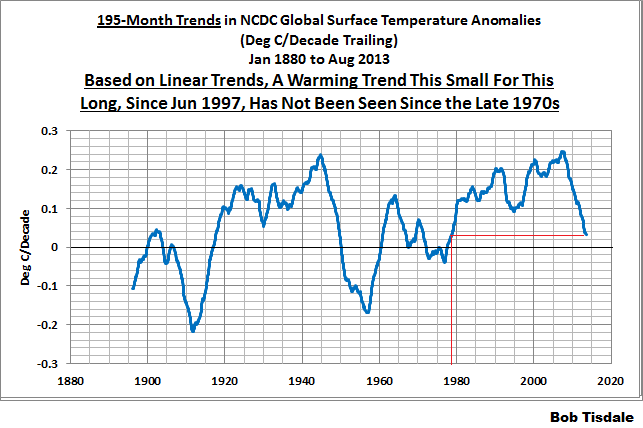 Refer to the following graph of running 152-month trends from January 1880 to May 2013, using the GISS LOTI global temperature anomaly product. 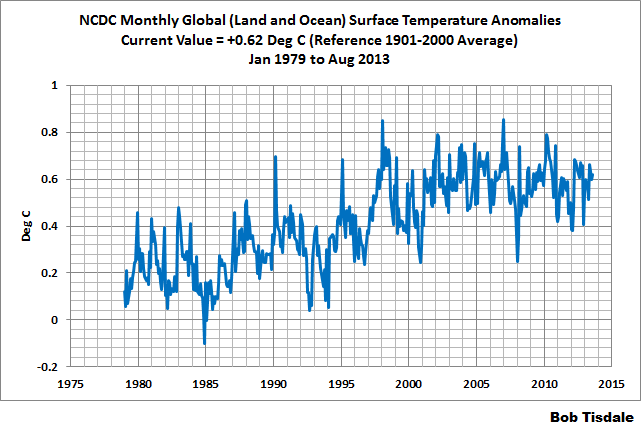 The last data point in the graph is the linear trend (in deg C per decade) from January 2001 to the current month. It is basically zero. 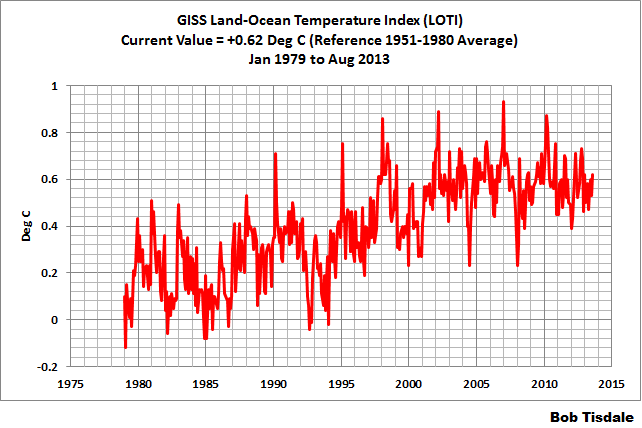 That, of course, indicates global surface temperatures have not warmed during the most recent 152-month period. Working back in time, the data point immediately before the last one represents the linear trend for the 152-month period of December 2000 to July 2013, and the data point before it shows the trend in deg C per decade for November 2000 to June 2013, and so on. The highest recent rate of warming based on its linear trend occurred during the 152-month period that ended in late 2003, but warming trends have dropped drastically since then. Also note that about the early 1970s was the last time there had been a 152-month period without global warming—before recently. In his RMS article, Kevin Trenberth also conveniently overlooked the fact that the discussions about the warming hiatus are now for a time period of about 16 years, not 10 years—ever since David Rose’s DailyMail article titled “Global warming stopped 16 years ago, reveals Met Office report quietly released… and here is the chart to prove it”. 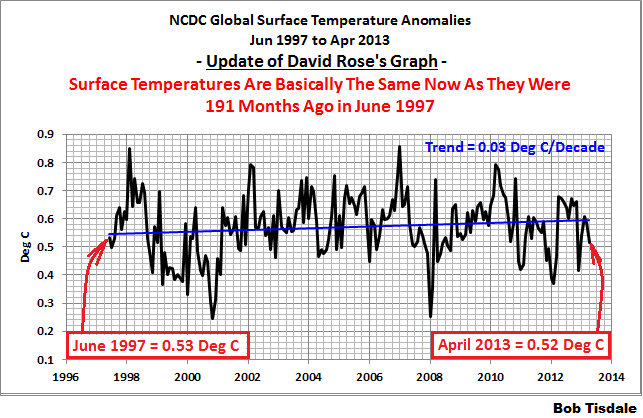 In my response to Trenberth’s article, I updated David Rose’s graph, noting that surface temperatures in April 2013 were basically the same as they were in June 1997. We’ll use June 1997 as the start month for the running 16-year trends. The period is now 195-months long. The following graph is similar to the one above, except that it’s presenting running trends for 195-month periods. The last time global surface temperatures warmed at the minimal rate of 0.03 deg C per decade for a 195-month period was the late 1970s. The most widely used metric of global warming — global surface temperatures — the metric most often used in predictions of future gloom and doom, indicates that the rate of global warming has slowed drastically and that the duration of the hiatus in global warming is unusual during a period when global surface temperatures are allegedly being warmed from the hypothetical impacts of manmade greenhouse gases. There is very little difference in the end point trends of 12+year and 16+year running trends if HADCRUT4 or NCDC products are used in place of GISS data. The major difference in the graphs is with the HADCRUT4 data and it can be seen in a graph of the 12+year trends. I suspect this is caused by the updates to the HADSST3 data that have not been applied to the ERSST.v3b sea surface temperature data used by GISS and NCDC. 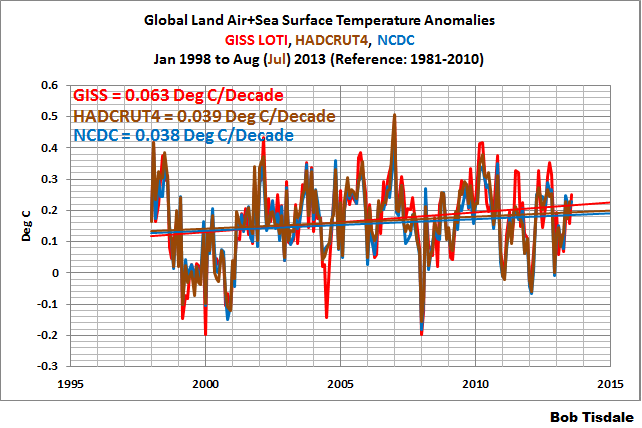 The GISS, HADCRUT4 and NCDC global surface temperature anomalies are compared in the next three time-series graphs. 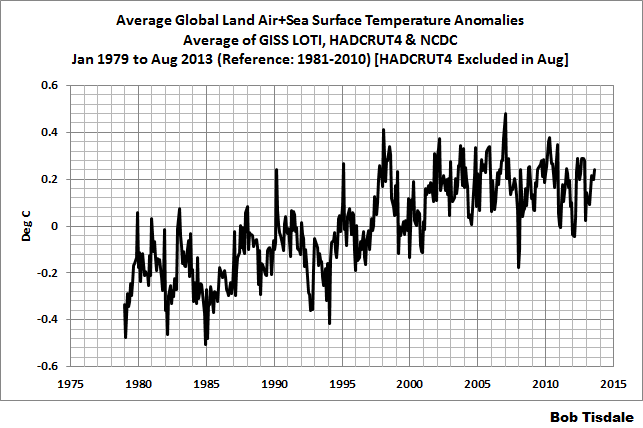 The first graph compares the three global surface temperature anomaly products starting in 1979. Again, due to the timing of this post, the HADCRUT4 data lags the GISS and NCDC products by a month. The graph also includes the linear trends. Because the three datasets share common source data, (GISS and NCDC also use the same sea surface temperature data) it should come as no surprise that they are so similar. For those wanting a closer look at the more recent wiggles and trends, the second graph starts in 1998, which was the start year used by von Storch et al (2013) Can climate models explain the recent stagnation in global warming? They, of course found that the CMIP3 (IPCC AR4) and CMIP5 (IPCC AR5) models could NOT explain the recent hiatus. 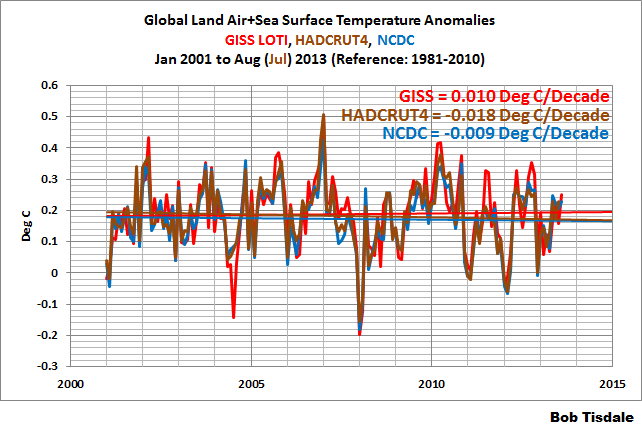 The last graph presents the average of the GISS, HADCRUT and NCDC land plus sea surface temperature anomaly products. Again because the HADCRUT4 data lags one month in this update, the most current average only includes the GISS and NCDC products. The flatness of the data since 2001 is very obvious, as is the fact that surface temperatures have rarely risen above those created by the 1997/98 El Niño. I published the post Models Fail: Land versus Sea Surface Warming Rates a few days after I published my ebook Climate Models Fail. Though the graphs in the post were from the book, the Table and text were not. That method of showing and discussing the models’ failings occurred to me after I published Climate Models Fail. I’ve decided to make available the additional posts about climate model failings, as they’re posted, as supplements to Climate Models Fail, in .pdf format. So if you’d like a copy of the post Models Fail: Land versus Sea Surface Warming Rates in .pdf format, click here. I’ll also include them as links on the post that introduced Climate Models Fail. This entry was posted in LOST Update. Bookmark the permalink.